HH Sheikh Saeed Bin Mohammed bin Rashid Al Maktoum (left) honoured the Dubai Airport Freezone with a gold award for its support to orphans. 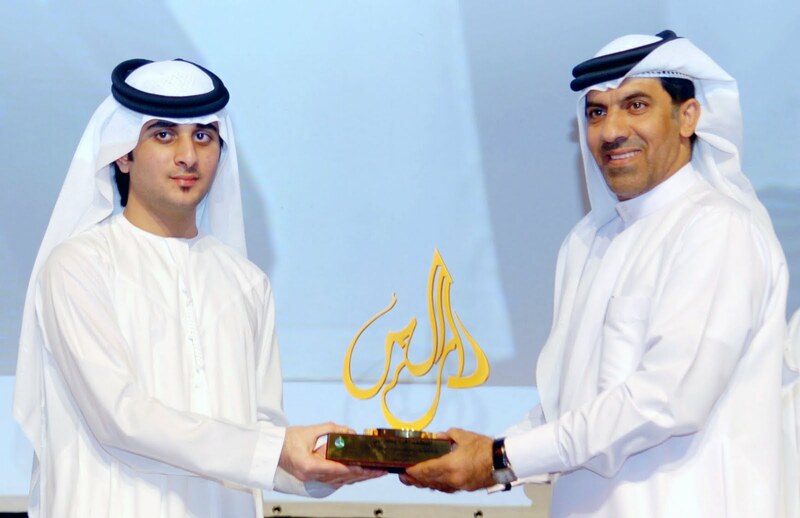 Ibrahim Hassan, Director of Human Resources of Dubai Airport Freezone received a memento on behalf of the Freezone. The awarding was held recently during Dar Al Ber’s fifth annual ceremony for orphans held under the Patronage of HH Sheikha Hind Bint Maktoum Bin Juma Al Maktoum, wife of HH Sheikh Mohammed bin Rashid Al Maktoum, Vice President, Prime Minister and Ruler of Dubai. Hassan pointed out that the Dubai Airport Freezone is committed to support the activities for an orphan which is part of the Freezone’s priorities and charity programmes targeting this important sector of society. Hassan also praised the annual initiative of HH Sheikha Hind Bint Maktoum bin Juma Al Maktoum, on behalf of the orphans. More than 200 orphaned children from Dar Al Ber Society attended the ceremony with a number of senior officials from local departments and representatives of sponsors and a large number of members from the public were present.